Over the last several years there has been an increasing wave of proposed bills that seek to restrict the rights of all breeders and fanciers. I am a huge believer in responsible dog ownership and "ban the deed" as opposed to any sort of mandatory legislation. For example, the city in North America which has the lowest kill rate in their shelters is Calgary -- they have no "mandatory this or that" legislation at all but a very active ownership education program. There are problems but they need to be addressed individually. Addressed as a blanket statement the problem won't get handled, just moved out of that particular city, county, state or nation. What all this mandatory legislation does is ban the honest, usually show breeder. This is the person who does all necessary tests on his or her dogs, screens owners carefully, is always willing to take a dog back and truly cares about the future of his or her breed. An excellent article appeared recently in the LA Times -- if the below link doesn't work, it was written by Judith Lewis in the Opinion Section titled The Obama Family Dog. I really wonder about the individuals behind this wave of proposed legislation. Do they want us to have pets? Or maybe they think we would be better off in a world where no one ever owned an animal? Makes me really wonder. I'm so pleased you are checking out my blog. I feel that small dogs do not get the same training attention as bigger animals. It's the "Awwww, isn't he cute!" syndrome. Well, those of us who have lived with small dogs know that within their little bodies lives lion hearts, and they deserve and need consistent, kind training just as much as their bigger cousins. I'm speaking specifically not only of the toy breeds such a Chihuahuas, Poodles, Yorkies, Silky Terriers and Papillions, but also Dachshunds, Beagles, Shetland Sheepdogs, Cocker Spaniels -- basically any dog under 30 pounds. My lawyer tells me that I have to let you know that you take my advice at your own risk. But I think you'll find my information simple and easy to follow. Feel free to ask me questions, and if it's okay with you, I will answer them on the blog. I also have two articles available for download. One is "7 Things to Forget When You Get Your New Puppy" and the other is "Grooming the Long-Haired Small Dog". Email me at smesmer@yahoo.com and I will send them to you electronically at no charge. If you are interested in my artwork, please visit my gallery at www.bergstromgallery.com. 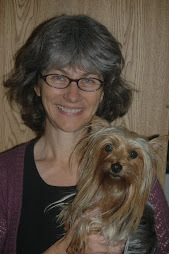 I have been breeding and showing Silky Terriers since 1981. In completing the championships of over 80 Silkys I have developed simple and logical ways to train small dogs, not just for the show ring, but also for the couch, the kitchen and the back yard. I get asked all the time for training tips so I thought it would be fun to start a blog about this. You can see my beautiful dogs at www.sandymesmer.com. I am a Maxwell nominated artist, specializing in canine art, (viewable at www.bergstromgallery.com) so my blog will have lots of pictures and a recurring cartoon, "Crazy Humans" lampooning the antics us humans get up to around our dogs. It's a wonder they put up with us! Hugo? You in here somewhere? Hugo??? Hugo? Are you out there? Hugo? HUGO?? Ha Ha! Humans are such suckers.